Proponho um assunto diferente, para agradar a quem diz que as nossas futuras OHP têm linhas menos bonitas. 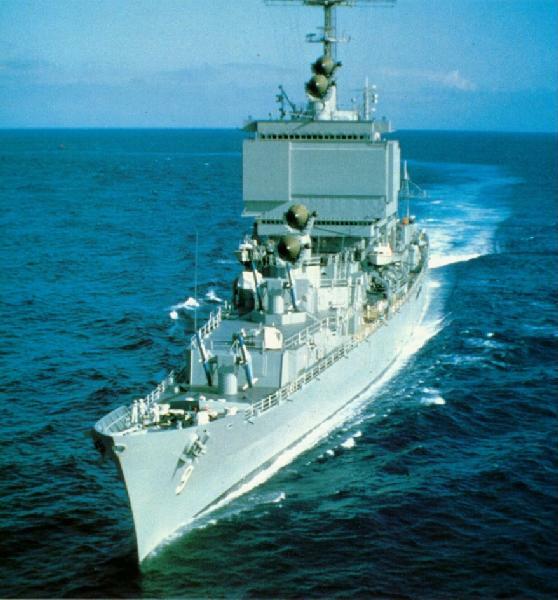 USS LONG BEACH was the first nuclear powered cruiser and first large combatant in the US Navy with its main battery consisting of guided missiles. She was also the first American cruiser since the end of World War II to built entirely new from the keel, up, and, when completed, boasted the highest bridge in the world. She was also the last warship to be fitted with teakwood decks. Built in Bethlehem Steel Company's Fore River Shipyard at Quincy, Massachusetts, the ship's keel was laid on December 2, 1957. The ship was later launched on July 14, 1959. USS LONG BEACH got underway on nuclear power for the first time on the morning of July 5, 1961. On September 9, 1961, the ship was commissioned at the Boston Navy Shipyard"
E o que me dizem desta beleza da estética? Couraçado Massena da Marinha Franciú. Porque é que havemos de usar uma sigla inglesa para falar deles? Porque não falar da Marinha Imperial Japo... E daí, se calhar é melhor não. O couraçado "Novgorod" da Marinha Imperial Russa, construído em 1871. Dois canhões de 280mm num casco redondo destinado a aumentar a estabilidade. Realmente, comparado com o Massena, o Fuso é uma beleza!